A terrific citrine gemstone measuring 17x14mm and a depth of 10mm. Expect the gem to attract a lot of attention, a simple and elegant design would look awesome. We have executed an intricate multi-faceted cut on the face of this big citrine gem. Cutting such gems requires tremendous expertise and concentration, a small mistake can involve a redo and this could involve beginning from a new piece of rough citrine and discarding the first piece. 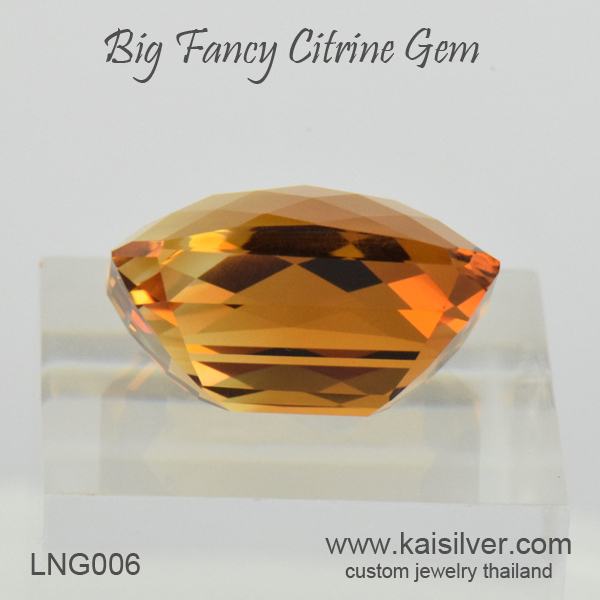 If you are aware of the various challenges involved in cutting large gems, you will find the 490 U.S$ price for this 17 carat citrine cushion gem to be extremely reasonable. Just to give you an idea of the weight loss that occurs when doing such intricate cutting operations, the piece of rough citrine that is used to end up with this 17 carat stone needs to be at least 150 carats to 200 carats. So is this large citrine worth its price, this is an interesting and important question. The answer rests with your true requirements, the reason why you wish to consider this specific gem. 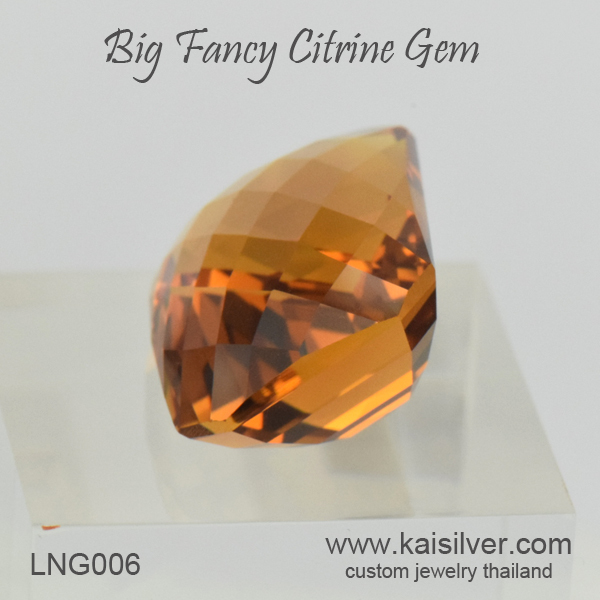 If all you want is a bulky citrine gem without, being too concerned of gem quality and cut - do not spend on this stunning citrine gem, just check out other sources for gems by weight and you should be able to fulfill your requirement easily. 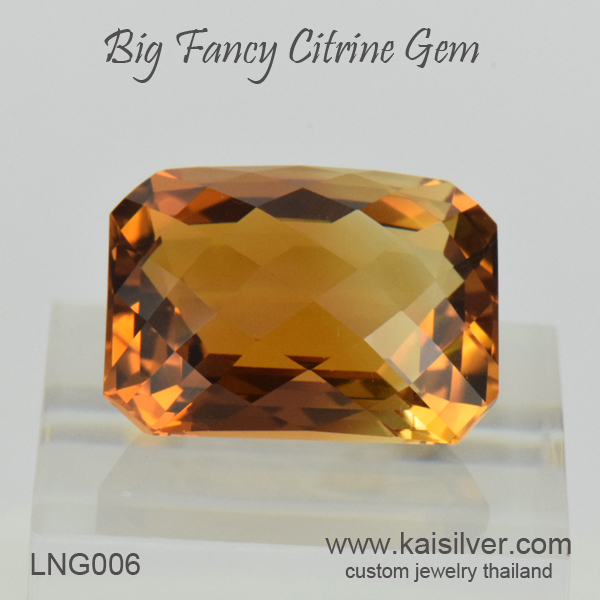 On the other hand if it is quality that you desire, this expertly cut citrine gem will not disappoint you. Kaisilver: We are the leading online high end custom made jewelry provider from Thailand. We can craft just about any jewelry that you wish to have made, in gold or 925 sterling silver. By maintaining the same quality standards of design, gems and workmanship for both metal options, we are perfect for all your jewelry requirements. The design for your jewelry can be yours or ours, we do not place any restrictions on gem selection. While we generally do not prefer to sell loose gems, we can occasionally accommodate requests for custom cutting gems that are hard to find or those that involve intricate cutting tasks. Contact our support experts at sales@kaisilver.com for any questions and requirements related to gems and jewelry that you might have.